Squadron Leader Martin Withers DFC joined the RAF in 1968. 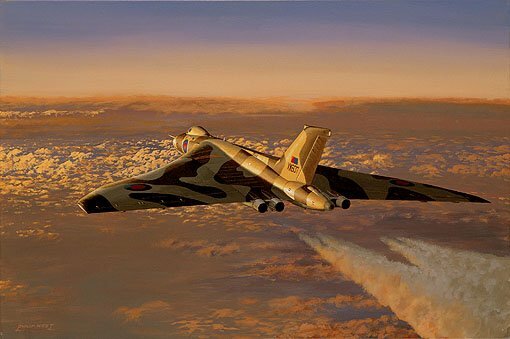 In 1971, he was posted to 44 Sqn at RAF Waddington as a Vulcan co-pilot, remaining there on 50 Sqn as a captain until 1976. After 3 years as a Jet Provost QFI at RAF Linton-on-Ouse, he returned to RAF Scampton as a QFI on the Vulcan Operational Conversion Unit. When the OCU closed, he moved again to RAF Waddington as Pilot Leader and Squadron QFI on 101 Sqn. The following year, during the Falklands War, he and his crew were selected to fly 2 of the 5 ‘Black Buck’ missions, for which he was awarded the DFC, with the other crewmembers being ‘Mentioned in Dispatches’. With the final demise of the Vulcan squadrons, he returned to No1 FTS at RAF Linton-on-Ouse, where he served as squadron commander and Deputy Chief Instructor, until leaving the RAF in 1991, having flown over 5500 hours (2000 on Vulcan’s). Since then he has accumulated a further 9500 hours on a variety of airliners, and is now flying the Boeing 767.